I was on the road this morning by 9:30, and headed west on I 80. After 270 miles I pulled into a Passport America campground about 40 miles west of Omaha, Nebraska. About the best I can say for this place is that it's OK for an overnight, but that's it. The weather forecast doesn't look good for tomorrow, but I'm hoping to at least get into Nebraska before the winds get too bad. I'm also hoping the rain tonight isn't too extensive as I'm parked on grass. Travel days are generally pretty boring, and that's the way I like them...no traumas or incidents. On a positive note, I have good internet and several TV stations. I'm bushed, so will just veg out watching TV tonight. Well, I'm back on the Mighty Mississippi River, again! The wind finally died down enough for me to hit the road out of Indiana Dunes State Park this morning. I did have a large branch on top of the RV, but it fell off as I began my travels this morning. I hit the road at 10:00, and made it through the Chicago area, and its white knuckle traffic, and pulled into Fisherman's Corner COE campground around 2:30, after about 200 miles. The campground is located right on the Mississippi River by Lock and Dam #14. All of the sites have electricity, and are only a mile off of I-80. With my America the Beautiful Pass, the cost is $9.00/night. There is road noise from Il-84, but the views of the river are worth it. and many squirrels. They are much darker in color than most squirrels, and really kept Emma on her toes this afternoon. They are everywhere. My plans are to head out earlier tomorrow and try to get across most of Iowa. Holy Mackeral!!! What a wind! When I woke up this morning, I looked outside and saw the trees bending back and forth. I took Emma for her first outs, and was nearly blown away. It turns out, this area was under a high wind advisory, and for a change, the weather people knew what they were talking about. There was no way I was going to try to drive this rig down the interstate. So, around 11:00, I went to the grocery store to get some milk, and stopped at the check-in station to pay for another night's lodging. The constant wind has been about 30 mph with gusts greater than 50! At one point, a dead branch landed on my roof and made both Emma and me jump. The sound of anything landing on the roof of the RV is exaggerated, and we have become accustomed to the rifle shots of landing acorns. However, a large branch sounds like we've been hit by a bomb! We ventured out a half dozen times for good walks today, but really had to bundle up. Then, about 7:30, as I was settling in to watch the new PBS series on our National Parks, the electricity went out. My battery power on the laptop will last about 45 minutes, so I'll do this post and then read a book or something. I guess there's a first for everything, and tonight I'm doing a second post in one day. Mostly it's pics of the granddaughters, but there is one great sunset picture. Robyn, Dennis, Avery, and Phoebe came out to my site at Indiana Dunes State Park today. I knew Avery would have a great time since my site is mostly sand. What kid doesn't like playing in the sand? In the meantime, Avery had discovered Emma's perch on the dashboard. You can really watch what's happening in the campground from this perch. A bird's eye view....no wonder this is Emma's favorite spot! I just had to share my best Mississippi sunset with you from my last night at Grant River COE campground, in Wisconsin, last Sunday. At the end of August, 2007, I left Alligator River National Wildlife Refuge in North Carolina and headed northwest for a return to Indiana. It was a busy six weeks before I headed south to Texas for the winter. While at my daughter's house in Dyer, IN, we all flew out to Las Vegas for the marriage of my youngest son, Andy, over the Labor Day weekend. I then flew back and drove the RV to the 2007 Escapade. From there, I returned to Rice Lake State Park in Minnesota to camp host for a month while I did my Mayo Clinic checkups, and have repair work done on the rig. Finally, it was time to head south. My first stop was at the Pleasant Creek State Recreation Area in Iowa. I met my sister, Pam, and her husband, Stan, there for the weekend. Pam and I toured the Amana Colonies, and we took pictures of each other in Iowa's largest rocker. It is the same rocker used by Lily Tomlin when she was on Laugh In. It was interesting getting up into that rocker! After spending the weekend with them, I continued on my journey with a five night stop at Watkins Woolen Mill State Park, a little northeast of Kansas City. What a historic place this woolen mill is. All the original equipment is still intact. I went on an interesting tour of the mill. The countryside in this park was gorgeous. As I made my way to the Rio Grande Valley, I stopped along the Gulf Coast to visit Aransas National Wildlife Refuge. Aransas NWR is the wintering home of the endangered Whooping Crane. I was hoping to see this magnificent bird, but I struck out. I will definitely return to Aransas some time down the road. The best way to see the cranes is to take a boat tour of the bay. I was unable to do that on this trip, but I'll be back. I visited many other sites on my three week excursion getting to Laguna Atascosa NWR, but these have been a few of the highlights of the trip. Both yesterday and today, I drove into Dyer, IN, to visit Robyn & family. What a hoot it is to watch an a 19 month old discover and enjoy her universe. Phoebe, the one month old, pretty much just sleeps and eats. Before returning to the campground, yesterday, I was in charge of piloting Avery up and down the aisles of Wal-mart while her parents had a meeting at a mortgage company a few buildings down. Avery babbled and babbled as we "drove" around. I needed to get a new road atlas and throw rug for in front of the kitchen sink. After finding what I needed, I headed towards the toy department, and Avery shouted "Elmo!" Sure enough, there was an Elmo toy on display. I always enjoyed Sesame Street when my kids were growing up, but Grover was my favorite. Apparently, Grover has slipped from the lime light, and Elmo is now a member of the "in" crowd. Today, I headed into Dyer fairly early and took Emma and my computer with me. My son-in-law, Dennis, was going to help me with a few computer issues I was having, and succeeded in solving all my problems. Ya-hoooo! I hooked Emma out to a tree in their backyard, and around noon my sister, Pam, arrived to visit for the afternoon and meet the new baby in the family. We all had a great time, and before you knew it, it was five o'clock, and time for me to pack up and head back to the campground before it got dark. I really don't drive after dark anymore unless it is really necessary. Robyn, Dennis, and the kids are supposed to come to the park to visit tomorrow, and then on Monday I'll be heading out towards Denver. It has been a great visit for the last week, but I'm ready to head on down the road. My daughter, son-in-law, and grandkids were supposed to come out to the park late this afternoon for a cookout, so I had the day free. After a good walk with Emma this morning, I headed for Valparaiso, IN, to the closest Best Buy store. My mission today was to purchase a GPS. I chose a Garmin 205W system and installed it in the car in the parking lot. Then I used it to find a store that sold the Saucony walking shoes that I wanted and needed to buy. Turns out that that store no longer carries that brand, so I headed out for Merriville, IN. I didn't find the Sauconies that I wanted there, but did find a couple of Nike Max Air shoes that were to my liking. On my way back to the campground, I stopped in Chesterton, at the Walgreens and was able to get my annual flu shot for $24.99. The Mayo Clinic hadn't received their supply of flu shots when I was there last week. I also got a good deal on the Jean Nate after bath splash and lotion that I like so well. Once I got back home, I received a call from Robyn that they would not be able to come out this afternoon. It has been rainy all day, off and on, so that wasn't a surprise to me. We'll hook up again tomorrow. With no visitors coming, I decided to work on getting all the bugs off of the front of the RV. I can't believe how many dead bodies there were on the front of the rig. It took quite a bit of elbow grease, but at least the windows will be clear when I leave next Monday. Emma and I took a couple of more walks around the campground, and then called it a day. I hope the weather improves for tomorrow. Yesterday, I got to meet my newest granddaughter, Phoebe Joanne Lapko. She is a sweet little girl with dark blue eyes and dark hair. Dark hair is unusual in our family tree, especially for little ones. She is one month old and mostly eats and sleeps, as is typical. I enjoyed holding her, although she is a squirmy little thing! Today was a journey to visit my mother who is in a nursing home in Schaumberg, IL. I attended the quarterly meeting on her progress. Her hearing aide has been, finally, replaced and we received a report on her surgery for some facial cancer. All seems to be going well on those fronts. I asked about her long term prognosis, and was told that she has been diagnosed with Alzheimer's disease. This was news to both my brothers and to me. It does, however, explain the deterioration that we have noticed in her cognitive abilities. I had thought they were due to recurring urinary tract infections. I guess that was wishful thinking. We were able to get a family picture while we were there. 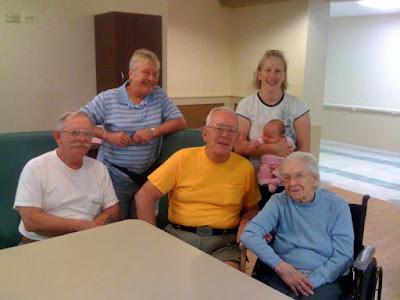 From the left, is my younger brother, Kurt, myself, my older brother, Carl, my daughter, Robyn, my granddaughter, Phoebe, and my mother. 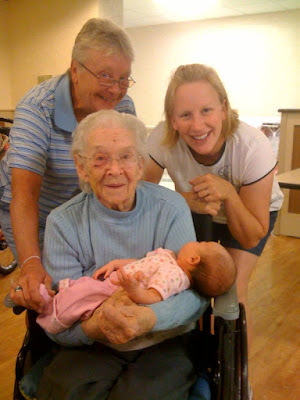 We also got another nice shot of our four generations of women. I was on the road by 8:45 this morning and headed to Indiana Dunes State Park. I thought it was about 240 miles, but it turned out to be 293 miles...more than I bargained for. I arrived in the Chicago area around 2:30 and white knuckled it through the early rush hour traffic. It was near 4:00 before I finally pulled into the state park. I spent the next couple of hours slowly setting up camp for the week. I'm pretty wiped out from all the driving today, but I'm thrilled to have everything set up and no trains within spitting distance! Tomorrow afternoon, I'll head for Dyer, IN, to meet my new granddaughter Phoebe, and babysit both girls for a few hours. Emma is enjoying all the sand in our site. She can dig to her hearts content....and then she turns around, starts digging again, and fills up the original hole she made. The texture of sand has always had an unusual effect on her. After a month on the ocean at Pea Island NWR, I moved over to the main land at Alligator River NWR. The two refuges share a visitor's center and staff work at both locations. I moved because I had absolutely no cell phone reception or internet out on the island. I was also growing tired of having to completely wash the salt spray off of the rig each week. A week or so after I was set up, I was casually eating dinner one evening when I happened to look out the side window. Much to my surprise, a female black bear, with three cubs in tow, had just walked through the RV pads! I took these shots through the window since I certainly wasn't going to go outside for a closer shot. As soon as mama bear decided it was time to leave, I hopped outside and reattached the electric fence. Wild Bill, the other volunteer, and I had become a little too complacent about keeping the fence closed during the day. I can assure you that we never neglected to close it again. ;) This mother bear's territory was right around the living quarters, and we sure didn't want her and her youngsters to get used to visiting too close. On July, 23, 2007, I got up very early so I could drive the 20 miles to meet the US Coastguard at the Pamlico Sound. They would be taking a group of volunteers from Pea Island and Alligator River out to a man-made island in the sound. They dropped us off on the island and would return later in the day to pick us up. Our mission for the day was to round up all the baby pelicans for banding. to about six weeks old. I wouldn't exactly call them cute....more like something only a mother could love! After chasing, and catching the older juveniles, we took them one by one to the banders. There is a method to handling these birds. You have to grab their beak with one hand, so you don't get pinched. Then grab both wings by the shoulder area with the other hand. Their webbed feet have very sharp nails on them, so I chose to hold them away from my body. Doing that also meant that I avoided being barfed or pooped on. :) Did you know that a pelicans pouch feels like the softest kid glove leather? After the banding, you had to return them to where you found them (in the same nursery group). What a day it was! We scoured the whole island and found and banded over 500 youngsters that day. We worked as quickly as we could since all of the adults were air born and circling overhead. The Coast Guard did return for us as promised, and we even saved some boaters in distress on our way back to the mainland. Their engine had died, and they were just floating along. We towed them back to port. A wonderfully exciting day, all in all. My duties at Alligator River were quite different from those at Pea Island. I still worked at the visitor's center every Tuesday, but once or twice a week, I took people on five mile canoe trips through two lakes and several long, swampy, Cypress channels. This is the spot where we put in for the canoe trips. We went under the bridge and then headed left on the lake to the channels through the swamp. I presented an interpretive program on the history of the swamp as we paddled. I seldom had a passenger in my canoe, so that made the curvy channels a real challenge. I ended up putting a couple of cement blocks in the bow of my canoe to keep the front end down. The average temperature in the swamp was 100*, and I was always dripping wet when we returned (and certainly not from falling in). There are a lot of stories to tell about these canoe trips, but it would take way too long here. Ask me sometime when you see me. On a few Wednesday nights, I led a bear finding tour of the refuge. It began by my presenting a short talk on the black bear and the endangered red wolves that are found on the refuge. I would then lead an auto caravan on the back roads of the refuge hoping to see some bears. I gave each car a walkie-talkie so I could communicate with everyone as we drove along. That was always a popular tour with visitors. When I wasn't busy with the tours or at the visitor's center, I maintained the Charles Karault Trail in the refuge. I also painted road signs and did a lot of litter pick up along the roads. It was a busy and exciting three months that I spend working on both these refuges, and except for the chiggers, I enjoyed it all! Sunset on Alligator River National Wildlife Refuge. P.S. I almost forgot....Alligator River is where I saw my first Luna moth...it was about 6" across. this Mississippi River sunset. A nice ending to a relaxing day. Choo choo trains...do you like them? Four nights here will really try my soul...talk about sleep deprivation! On the bright side, I'm hoping that things will slow down for the weekend. We'll see if that is a naive hope. I did head out today just before noon to got to Potosi to visit the Potosi Brewing Company. This was a brewery that produced Potosi Beer starting in 1850. Eventually, it closed down since it couldn't compete with the big breweries in Milwaukee and other parts of the state. After touring the museum, I had lunch in their restaurant and tried catfish for the first time. It was good, but I thought it was a little mushy. I guess I like a little firmer fresh water fish. On my way back to the campground, I stopped at Potosi Point hoping to see some bird life. The only thing there was a great egret. It's a little too early in the fall migration season to see much, but there were a few white pelicans further down the river. was a natural spring, with cup included for a thirsty traveler. I'm not sure I'd use that cup for a drink unless I was desperate! Here's my site at the Grant River COE campground. I have a site at the end of the row, so I have a little more privacy than other sites. It would be a very acceptable site, if not for the trains. A fellow SKP couple stopped by to chat this evening as Emma and I were enjoying the evening. We had a nice visit, and I'll probably converse with them further this weekend. They have been on the road fulltime for 10 years, so I'm just a beginner in their eyes. Escapees are always friendly and fun to talk to. Believe it or not, my four-footed alarm clock decided to sleep in for the first time in her life! I was the first one to awaken and it was 7:26! So much for my plans to be on the road by 7:30 to get to Universal RV early. I blasted out of bed and was able to take Emma out for her duties, finish packing up, and made it to Rochester by 9:00. Phew...that was a challenge. After dropping the RV off, I headed to PetCo to get a "furminator" for Emma. It is a tool for removing shedding and loose hair. The price was way more than I expected, but luckily, one of the employees showed me a similar model that she uses for grooming at PetCo and it was half the price. Then it was off to get the car washed at my favorite place in Rochester. The Focus was really a mess after the gravel roads of Rice Lake. That completed, I still had time to kill while waiting for the levelers to be fixed. I decided to visit Golden Hill Education Center. That's where I was principal of the Alternative School before I retired. It was great to see all of the folks and the improvements that I had struggled so hard to implement. Many of those improvements have been put in place. While there, I got a call that the motorhome was ready, so I returned to Universal. Once I got all hooked up, again, and filled the gas tank, it was only noon, so I decided to head for Wisconsin. Actually, it's a good thing I drove the whole way here today, as all of the non-reservable campsites are now full for the weekend. All of the reservable sites are booked for the weekend as well. What a surprise to find this campground so full at this time of the year. I'll be staying here four nights, and hope to get some pictures tomorrow of the Great Mississippi. After speaking to my neighbor, I think I'll go to a local brewery for lunch tomorrow. After going to Owatonna to do the laundry this afternoon, I continued my pack-up ritual when I got back. I stowed the DISH and managed to get everything else put away after enjoying my last campfire at Rice Lake. The birds were a little confused after I stowed all the bird feeders, but it's time for those hummingbirds to move south anyway. The nuthatches and chickadees will get along, and the raccoon that has been messing around with Emma's water bowl every night will have to find a new source. Yesterday, I was reading a spring copy of the Minnesota Conservation Volunteer magazine and read an article about how Minnesota is beginning a five year effort to conduct a breeding bird atlas and is looking for volunteers. I helped with the New York State Breeding Bird Atlas in the late eighties, and as you know, birds are my "thing". So, I gave the coordinator a call yesterday afternoon and left a message about my interest and experience. Today, while I was at the laundromat, I got a call back. The coordinator called me and was thrilled that I would be interested in covering areas where there are few volunteers. I'm excited about this opportunity. After all, I've got wheels and can go where I'm needed. She'll be sending me a map of the areas that need coverage and I'm thinking either northwest MN (where I've never been) or maybe the northeast. I do love the Gunflint Trail region of the state. I'm pretty sure I'll have to foot the bill for the campgrounds, but with my newly acquired "senior pass", I'm hoping to take advantage of the national forest campgrounds at half price. Besides, birding is what I love to do, and how cool will it be for me to investigate the back roads and byways hunting documentation of breeding! Many years ago when I was a child, I remember playing a game with my younger brother, Kurt. It involved two toothpicks, two Sears Christmas catalogs, and many pictures that were cut out of magazines. I don't kow if my mother devised this game to keep us quiet or not, but I do remember enjoying it. We scattered the cut out pictures throughout our catalog, and then took turns poking a toothpick into our oponent's book hoping to find a page with a picture in it. If we were successful, we put that picture in our catalog. Of course, there were very favorite pictures that were coveted by both of us. While I was reading through some of my magazines today, I thought of that game. I don't get very many magazines, but a picture of a cracker tripped me back. Since I have four grandchildren and another on the way, I decided I'd start collecting interesting pictures from the magazines so when the grandkids are old enough to visit me, I'll have the catalog book game to play with them. I'm not even sure Sears puts out a catalog anymore, but I'll find something. In the meantime, I've got about 40 pictures cut out so far, but need many more. I'll work on it as I move around the country. Does anyone else remember this game? I was up before the crack of dawn today to return to the Mayo Clinic for a blood test and a ECG. That's it for my medical appointments, so I'm free to move on as soon as the parts come in for the motorhome. In preparation for moving on, I began the slow process of packing up today. I removed the face from the tree, beat and folded up the outside rug, and returned several outdoor items to their basement storage places. If I get a call from Universal RV, my plans are to head out on Thursday or Friday. If the parts don't come in, it will put a real crimp in my plans. I do have a reservation at Indiana Dunes State Park next Monday, that has already been paid for. Oh well, I guess I'll just see what happens. Last night, after having spent the afternoon at my son's house having a chicken bar-b-que, I decided to call them back up on the phone to see if they'd be interested in helping me wash and wax the rig. Who could pass up a chance like that? ;) Of course, I sweetened the pot a little with the promise of some spendable green stuff. So, once more I packed up the rig and drove the twenty miles to their very spacious driveway. Andy and I did most of the work while Kelly kept herd on the two active grandsons and prepared lunch for everyone. Washing and waxing the rig is one of those chores that I really have to force myself to do. It's a lot of work, and if I had to do it all myself, it would have taken me days. How nice it was to have family to visit with as we worked. It made the job almost enjoyable....almost. In June of 2007, I began my volunteer assignment at Pea Island National Wildlife Refuge. Pea Island is located in the middle of the Cape Hatteras National Seashore on the coast of North Carolina. The front yard of my volunteer site was the Atlantic Ocean. I only had to walk about twenty paces to have this view. I spent many on evening walking up and down this pristine beach looking for shells. I have always wanted to live by the ocean, and for a month my dream came true. I was able to visit all three of the lighthouses on the national seashore. and the Ocracoke Island lighthouse. Each is painted differently to aid in mariner's navigation. Their beacons at night are also different so sailors knew their location along the coast. I really enjoyed the names of places here, like Nags Head, Kitty Hawk, and Ocracoke Island. I ate my first crab cake on Ocracoke Island and liked it. One of the enjoyable things I got to do was be a participant in the turtle watch. Each summer sea turtles arrive at night to dig a nest hole and deposit their eggs. These nests are monitored by volunteers and after close to two months, nightly turtle watches begin. The circle at the top of the picture is the location of the nest. We use garden edging to construct a runway for the young turtles to travel down to the ocean. You're probably wondering why. Well there are two reasons. One is that these turtles are endangered and the path gives them a straight shot to the ocean. The other reason is the most important one. The runway combined with volunteers with sticks patrolling it keep the ghost crabs away from the hatchlings. If we didn't flip the crabs away, they would kill all the young. They run up and snip the muscles of a flipper and then move on to find another victim. Eventually, they come back and drag the incapacitated turtles down their crab holes. If we didn't guard these nests, there would be very few turtles that would make it to the sea. Now if I could just remember the name of this species of turtle I'd be happy, but my mind is drawing a blank right now...sorry. The eggs are buried deep in the sand and are the size of a golf ball. This photo, and the next, are from the display at the visitor's center. It will give you a good idea of what I'm talking about. The turtles always hatch at night and use the light of the moon to direct their way to the ocean. There can be close to one hundred eggs in a nest and most hatch at the same time. When they begin to climb to the surface it is called a boil, and that is exactly what it looks like....water boiling. I was lucky enough to be on hand when a nest hatched. The nests are "watched" from 7:00 pm until midnight. My first night on patrol, we had a boil at about 9:45. It was my job to count the number of hatchlings as they began their way down the path. We had 49 hatch that night, and all made it to the ocean thanks to the diligent stick patrol! You might think it would be easier if we just picked them up and carried them to the water, but that won't work. Each hatchling must make that perilous journey on it's own so that the location of the beach will forever be imprinted on them. That way, they will know where to come back to breed when they are old enough. This evening, I got a campfire burning so I could cook my dinner. There's nothing like a good old American tube steak (aka: hot fog...Hebrew National of course) grilled over an open fire! Earlier in the day, I spent the afternoon planning my journey to and in Colorado. I'll be visiting Daniel and Crystal in Denver after my trip to Indiana to see Phoebe, my latest granddaughter. This morning, I noticed that the nuthatches, chickadees and goldfinches are not the only ones taking advantage of the seeds I've put out for them. A cute little chipmunk has found the bonanza of seeds underneath the feeders. This, of course, drives Emma to distraction! Here's an interesting group of mushrooms that I found growing in the campground. The black border around each shroom seems to drip down the stems. Don't know what kind they are, but mushrooms are one of my favorite things. That's what today was about. I was at work when this tragedy occurred, and everyone at the school was glued to the television. It was a time of disbelief. Yesterday, I did the laundry thing and picked up the thin sliced round steak from Firehouse Meats. I'll be making "birds" soon. Then I spent the afternoon meeting with my financial advisor. She is based in Mankato, MN, and drove out to Rice Lake to meet with me. That took most of the afternoon, but she did report that I should have funds to last me until I'm 92. That's encouraging! Today was a pretty relaxing day. I picked up my mail and did quite a bit of reading. This evening, my friend, Susan, stopped by and delivered my drapes that she had refurbished. They should be good for another three years. Thanks Susan! I also got a call from the optometrist that my new glasses are in, so I'll be stopping there tomorrow after I take the rig into Rochester to have some warranty work done. I'll be dropping Emma off at my son's house (with a fenced yard) so I can get some errands done without leaving her in the car. The weather continues to be spectacular and I'm really enjoying this visit to Minnesota. If you have never been to the Mayo Clinic in Rochester, MN, it is worth a visit. Besides the fantastic medical expertise, the grounds of the clinic are beautiful. Outdoor gardens and artwork abound. Many of the hallways are marble, and it's almost like a city unto itself in the subway labyrinth. It is a grand place to visit even if you don't have medical issues. Around mid morning to early afternoon there is also live grand piano music supplied in one of the huge waiting areas, and you can get to both hospitals and all the medical buildings through underground tunnels or overhead enclosed walkways. This is especially nice during the bitter winters that can occur here. Besides medical buildings, there are also restaurants and various clothing and shoe stores, and boutiques. The walkways and tunnels also attach to the parking garages and hotels. Quite often you'll be in a waiting area with celebrities or rich shieks. On the medical side, patient handling and expiditing has been honed to a science. As an example, the total time from entering the door to leaving today for my mammogram was about twenty minutes! Think how much time the normal person sits waiting for their appointment, and this is astounding. I got a few appointments out of the way today, made arrangements to have warranty work on the rig done, and enjoyed a great lunch at the Sky Dragon Buffet in downtown Rochester. In all my travels, I have not found a Chinese Buffet to compare with the excellent food served here. The lunch buffet is $5.99, and worth every penny. I just got a call from the kennel where Emma is staying, and the owner has just returned home. So, it's off to pick up my companion before it gets dark. What does a camphost do? There are five pit toilets scattered throughout the park, one semi-modern bathroom, and one bathroom with flush toilets and showers. I don't have to clean them, that's done by the staff, but I do need to make sure there are enough supplies available throughout the day and night. I generally tour all of them about three times a day on a busy weekend. I also post the reservation signs at individual sites and answer all sorts of questions from the campers. This was a pretty quiet holiday weekend. On Saturday, I drove around the loops to remind campers of the astronomy program being offered. Sunday night, about 7:00, a camper came to inform me that the lights had gone out in the main bathroom building. I appreciate it when they let me know about problems. After investigating the problem, I called the park manager, Joel, and between the two of us, we were unable to get the lights to work. He called an electrician, but being a holiday weekend, he was unable to come out. So, that meant I drove around to every site to tell them to bring a flashlight if they were going to use the bathroom last night. By visiting each site, I avoided having multiple campers knocking on my door all night, and I believe I prevented folks from becoming upset over the situation. Today, the electrician showed up in the early morning, and the lights are now working. Then it was the mass exodus, and almost all campers had left by noon. Once everyone was gone, I hopped in the cart and visited each site to pick up garbage and toss any extra fire wood in the back of the vehicle. I must say that this only took me about an hour. What a difference from when I hosted in South Dakota. Minnesota folks are extremely neat. They not only put all of their trash in the dumpsters, but they also put all their plastic, glass, and aluminum in the recycle bins! When I hosted at Richmond Lake Recreation Area in South Dakota, it took me a half day to just pick up the trash left behind by campers, and the number of sites was half what it is here. There were no real emergencies this weekend, and things went quite smoothly. Over the years, I've had some real hair raising situations, and some really comical happenings at this park, but thankfully, not this weekend. So....that's some of what I do as a campground host. This evening, I took Emma to a boarding kennel for the night. I've got a couple of medical appointments tomorrow, at the Mayo Clinic, as well as other errands I have to run. She would have been stuck inside the rig for too many hours, so she's having a little holiday (and so am I). When I left Anahuac NWR, back in May of 2007, I stopped the first night at Caddo Lake State Park in Texas. My intentions were to just stay one night, but I changed my mind once I got there. There was too much to see and do for just one night. This campground epitomized what I had in my mind of a swampy Southern bayou. The cypress trees around and in the water were draped with moss. The second day that I was there, I took a tour on a pontoon boat that was run by a woman. I'm glad she knew where she was going, because I surely would have gotten lost back in this swamp! What a great tour this was. I especially enjoyed seeing the prothonatory warblers flitting by at eye level. The third day I was there, I went on a nature hike that was led by Gwen Young, the campground host. Gwen and her husband, Jim, had hosted at Caddo Lake for several years. It was hard to believe they were 87 years old with the way she led us up and down the trails of the park! While I was busy enjoying myself for those three days, a pair of very persistent Carolina wrens had decided that my rig was the ideal place for them to build a nest. Not just one nest, mind you, but three! One was on a shelf under my slide-out, one was under the slide-out awning, and the last one I found in the basket of my mo-ped. The nest on top of the slide-out proved to be the most difficult to remove. That area is close to 12 feet from the ground, and I don't have a ladder that tall. I had to balance my footstool on top of my ladder and then try to sweep the nest out with a broom over my head. I was finally successful, and then quickly went inside and brought the slide in before the wrens had a chance to add any more sticks.